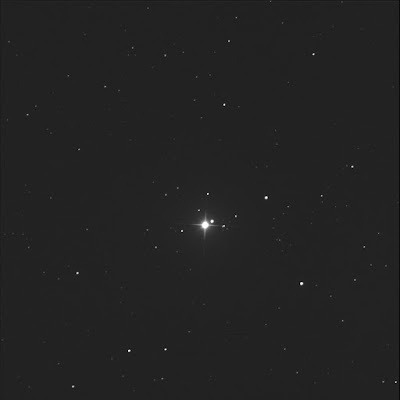 The BGO robot imaged Miram in Perseus for me. This should be a very colourful multi-star system. Luminance only, 3 seconds subexposures, 10 stacked shots. FITS Liberator, Paint.NET. North is up; left is east. This was a target from my View Again list. I had not split C and D in the past. That is easily done in this image—the faint pair to the west of the primary. C is the brighter outer star; D is the fainter inner star.